Japan Day @ Central Park is now preparing for Japan Day 2017, to be held at Central Park in May 2017. Today we are thrilled to announce our 6th Annual “Japan Day Art Contest.” The winning artwork will become the official image of Japan Day @ Central Park 2017 and will be used for our official poster, program, flyer and T-shirts. The grand prize winner will also receive a pair of round-trip Economy Class tickets to Japan, provided by ANA. In addition, several artists will receive honorable mentions. The grand prize winner and all honorable mention winners will each receive a digital camera provided by Nikon Inc. Moreover, their artwork will be displayed at an exhibition space on the 18th floor of the Consulate General of Japan in New York. been active as an artist and art director, contextualizing Harajuku and “kawaii” culture into his work. He will select a piece from the submitted work as the special “Sebastian Masuda Award”!! All winners will be honored at an award ceremony on the day of the event. Please see next page for contest details. We look forward to your submission!! All winners will be announced in late March/early April, 2017. ・Digital camera provided by Nikon Inc. In addition to above, all winners’ artwork will be displayed at an exhibition space on the 18th floor of the Consulate General of Japan in New York. Click “SUBMIT” below for more information about Japan Day Art Contest! Japan Day is currently seeking volunteers interested in participating in the event for the following categories. All the stage programs and food/activity tents are expected to be held at the Bandshell area in Central Park. Please note that not all applicants can be selected due to the space limitations of the venue, the event budget and the park regulations. Please see below for the details. We very much look forward to receiving many applications and celebrating this 11th annual event together! Click “STAGE PERFORMER” or “TENT ORGANIZER” below for more information. Selected Performers and Tent Organizers will be announced by late March/early April, 2017. *Please be aware that not all applicants can be selected due to the space limitations of the venue, the event budget and the park regulations. If you have any questions, please contact the Japan Day Project Liaison Office. 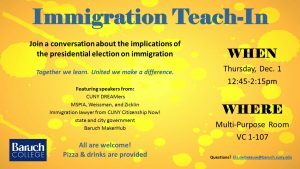 a group of faculty in Weissman and SPA are holding an immigration teach-in this Thursday in the VC multipurpose room on the first floor during club hours. We’ll be serving pizza and drinks, too. 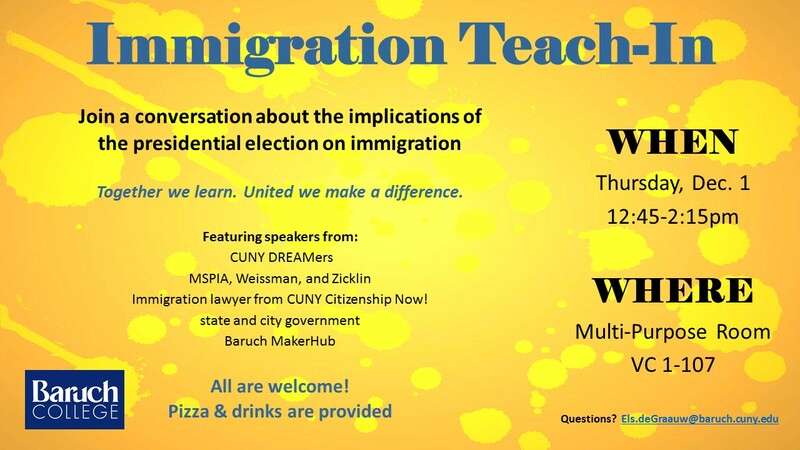 We’re going to have a variety of speakers, including a lawyer from CUNY Immigration Now, a representative from the New York Office for New Americans, some of the CUNY Dreamers, two of the deans, etc. Our aim is mostly to allow students to air their concerns and to get information about the situation for immigrants after the election. 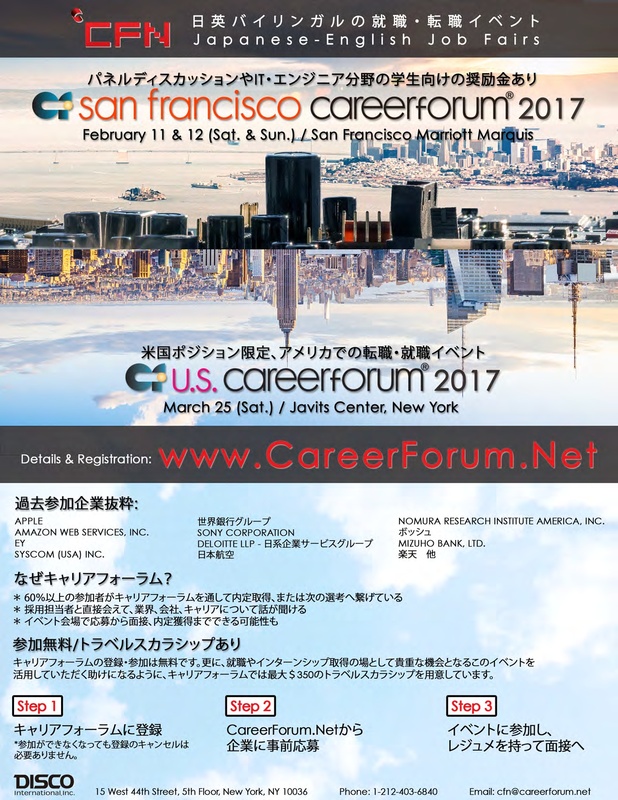 The Upcoming Japanese-English Career Forums in U.S. 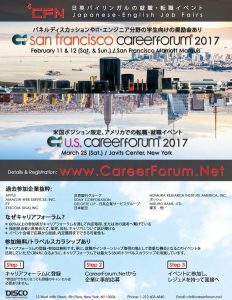 This is information about the next upcoming Career Forums for Baruch students with Japanese and English language abilities (ie. students from Japan, students studying Japanese, etc.). 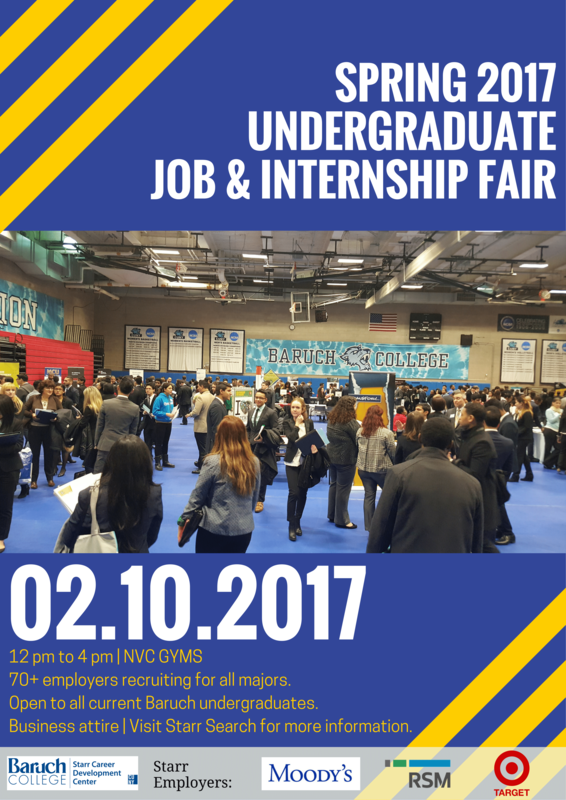 Baruch students with some degree of both Japanese and English language abilities are invited to come speak and interview with hiring companies for full-time and internship positions at the upcoming Career Forums in the U.S. and Japan. Many companies make offers of employment or internship by the end of the event. Career Forum registration and attendance are entirely free. Posted in Uncategorized	| Comments Off on The Upcoming Japanese-English Career Forums in U.S.
We invite you to join us in celebrating the publication of Professor Paul Anderer’s recent book: Kurosawa’s Rashomon: A Vanished City, A Lost Brother, and the Voice Inside His Iconic Films. 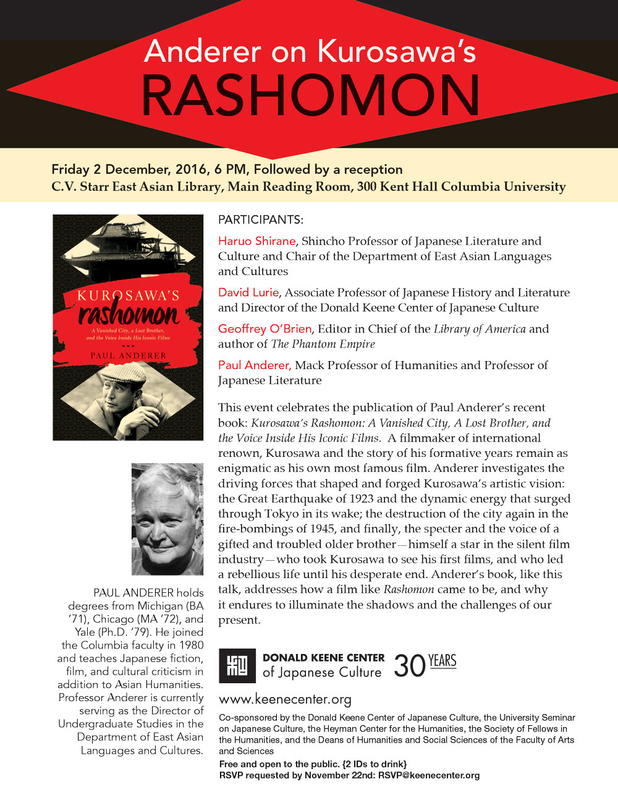 This event celebrates the publication of Paul Anderer’s recent book: Kurosawa’s Rashomon: A Vanished City, A Lost Brother, and the Voice Inside His Iconic Films (Pegasus Books, October 2016). A filmmaker of international renown, Kurosawa and the story of his formative years remain as enigmatic as his own most famous film. Anderer investigates the driving forces that shaped and forged Kurosawa’s artistic vision: the Great Earthquake of 1923 and the dynamic energy that surged through Tokyo in its wake; the destruction of the city again in the fire-bombings of 1945, and finally, the specter and the voice of a gifted and troubled older brother—himself a star in the silent film industry—who took Kurosawa to see his first films, and who led a rebellious life until his desperate end. Anderer’s book, like this talk, addresses how a film like Rashomon came to be, and why it endures to illuminate the shadows and the challenges of our present. Please visit our website, www.keenecenter.org, for the latest information on our events. Copyright © 2016 Donald Keene Center, All rights reserved. Posted on November 19, 2016 by Admin. 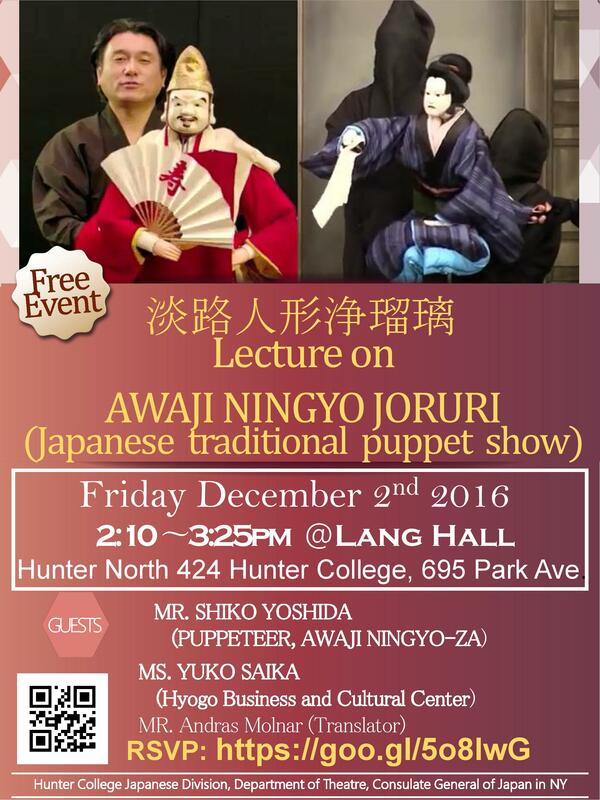 The Japanese Division at Hunter College is excited to invite you to an “Awaji Ningyo Joruri (Japanese traditional puppet show) event. As Kawnko san had mentioned, this event was initiated and is going to be funded by the Japanese government. We hope you and your student can join us! Location: Lang Hall, Hunter North 424. Hunter College, 695 Park Ave. The event is free, but we would appreciate if you could register using the following link. We will send your information to Hunter Security so that you will easily be able to enter the campus. I have also attached a poster for the event. Please feel free to post it or send it to anybody you think would be interested. The 30th annual Boston Career Forum November 18th – 20th, 2016. 200+ employers! the world’s largest job fair for students with at least conversational Japanese and English language abilities, being held Friday through Sunday at the Hynes Convention Center. Career Forums are an excellent (and free) way for your students to learn about opportunities to use their Japanese studies in their careers. For juniors and seniors in particular they are great events for interviewing with hiring companies and finding internships or full-time employment. If you have a moment to come and see the Boston Career Forum for yourself, please see the times below that I will be available to show you around. Please send me a message by Friday, November 18 indicating what time you might like to come. Posted in Uncategorized	| Comments Off on The 30th annual Boston Career Forum November 18th – 20th, 2016. 200+ employers! Posted on November 13, 2016 by Admin. 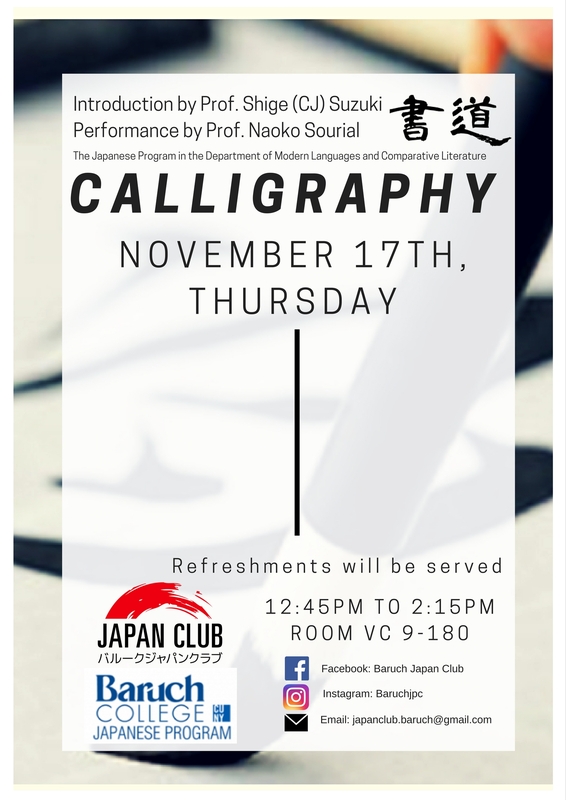 The Baruch Japanese Program in conjunction with Baruch Japan Club will host a calligraphy workshop on Thursday, November 17th during the club hours. You will learn and practice calligraphy in the session! Bring your favorite Japanese words/kanji in order to demonstrate them in calligraphy! Light refreshments will be served. Posted on November 10, 2016 by Admin. Full Scholarships Available for Intensive Language Study at the Middlebury Summer Language Schools– The Kathryn Davis Fellows for Peace will cover the full cost of one summer of language study (tuition, room, and board)—from the beginner to graduate level—in any of the eleven languages offered: Arabic, Chinese, French, German, Hebrew, Italian, Japanese, Korean, Portuguese, Spanish and Russian. The deadline is December 15, 2016. See the website for application details. The Middlebury Language Schools celebrated its Centennial in 2015. Our website has more information on all eleven Language Schools, the Language Pledge®, activities and the online application. Middlebury’s Arabic, Italian, and Korean programs take place exclusively at our West Coast Site at Mills College in Oakland, California. All other programs take place at the Middlebury College campus in Vermont. To receive more information by email, please fill out this form. Need-based Financial Aid Available to All Students – Nearly half of 2016 Language Schools students received financial aid. Learn more about financial aid and other scholarships and fellowships.